One of our core values here at The College Investor is that it is essential to both earn money and save money. Financial balance is the key to wealth over time. No financial goal can really be achieved without doing both. So when it comes to paying for college, the same is true. Hopefully you've saved a little, and hopefully you're looking for ways to earn more. This scholarship is designed to help you save. But you have to show us what you're doing to earn more. I'm a firm believer that the most successful college students are those that works and side hustle during school. Not only does it help to earn some extra money, but it helps build skills like communications, sales, problem solving, and more. Let's dive into it more, and talk about how to enter. I personally started building a side income all the way back in Middle School. I used to convince my mom to buy the multi-pack Snickers and Three Muskateers bars at Costco. I would then take them to school and resell them individually at break and lunch time for a profit. I would make $10-15 per week profit doing this! ​And that was just the start. I'd do all kinds of random things to earn money. I used to caddy for bridge tournaments (you know, the card game). I used to sell things on eBay while in high school. I got my first real job at 16 and worked all the way through high school and college. The bottom line is, making money is essential to financial health and wealth. Even more so, the life skills gained by side hustling are huge: communication and selling, problem solving,​ math and computer skills. The list goes on. That's why I want to reward those who are already side hustling. We're proud to offer an annual scholarship of $2,000 to new and current college students. We will also offer a runner-up scholarship of $500. Submissions will be accepted starting in February, with the winner selected in July. The goal of the scholarship ​is to recognize and award individuals who are both pursing higher education while working hard to achieve their dreams financially. We want to hear about the creative and passionate ways that individuals are working towards their dreams - both literally and figuratively. This scholarship is not about how much money someone is earning at their side hustle. In fact, little consideration will be given to that. It doesn't matter if your side hustle is earning $100 or $100,000. What matters is your effort, thought process, and goals. We want to know your story. 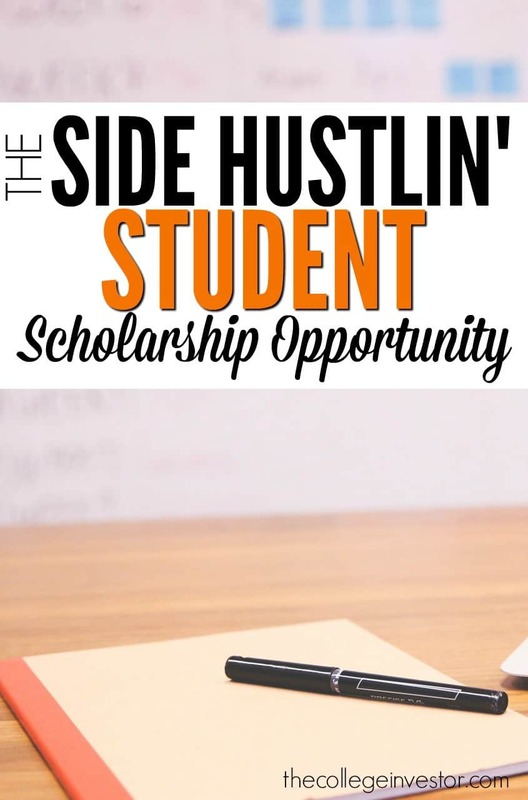 Here are the details on how to apply for the Side Hustlin' Student Scholarship Opportunity. Applicants must submit a 600+ word essay about how you are earning extra income on the side of going to school. Topics can include anything from how you started a business, to why you decided to get a job, to how your parents encouraged you to work. The best applicants will share a story about their life/dream/goals and how they endeavored to achieve it financially through work/side hustle/business venture. Applicants must either be enrolled or actively applying for enrollment to an undergraduate or graduate program.​ Students at technical, community, and four-year colleges are welcome to apply. All entries must be received by March 31, 2019. Applications should be submitted to robert@thecollegeinvestor.com. Please include a name, address, phone number, and headshot to be included with article publication. Please include "Scholarship" in the subject line. The entry should be in a word document, appropriately formatted, with use of good spelling, grammar, and punctuation. Essays will be screened, and the top essays will be published on The College Investor. The scholarship winner and runner up will be selected on July 31, 2019 by the article that generates the most social media "buzz", as determined by social shares. Applicants are encouraged to generate support for their story through friends and family. Take a look at the finalists and winners from last year to get a good sense of what we're looking for. Developing a side income is a skill that is essential for everyone. We are encouraged by stories of people starting young and working their way through school. Note: About 75% of all entries are disqualified because they don't follow the basic instructions above. If you're going to take the time to submit, take the extra five minutes to do it correctly. The winners for 2018 are live here: 2018 Side Hustlin' Student Scholarship Finalists. Please go vote and show your support. Side hustling is a totally great way to build skills that can be used in many aspects of life. Love seeing awesome scholarships like this! I aspire to one day offer scholarships on my own blog, keep up the good work Robert!